Welcome to the Hudson County Economic Development Corporation (HCEDC)! The HCEDC is a not-for-profit corporation in Hudson County that supports business retention, expansion and community development initiatives and provides business training and mentoring programs. Our work is undertaken in partnership with governmental, educational, civic and nonprofit partners. Located on the Hudson River directly across from Manhattan, Hudson County is the ideal place to do business. New Jersey’s smallest and most densely populated county, Hudson County is also the State’s fastest growing county. Hudson County is comprised of 46 square miles of land that includes commercial, industrial, residential and public open spaces. Hudson County is a major transportation hub in the Northeast with a confluence of railways, roads and waterways. Major roadways such as the New Jersey Turnpike, US Routes 1 & 9 as well as vehicular water crossings including the Holland Tunnel and Lincoln Tunnel all transit through Hudson County. Given the County’s location along the banks of the Hackensack, Hudson and Passaic Rivers, Hudson County is home to both cargo and passenger shipping terminals including Port Jersey and Cape Liberty Cruise Port. As a result of Hudson County’s public transportation system, Hudson is the only county in New Jersey where more residents commute via public transportation than vehicle. With NJ Transit rail, bus and light rail all providing service to residents as well as Port Authority’s PATH System and passenger ferry service- Hudson County provides plenty of efficient options to commuters. With several institutions of higher education located in Hudson County, employers can ensure a well-educated workforce. New Jersey City University, located in Jersey City is organized into three colleges offering 41 undergraduate and 27 graduate degree programs. Also in Jersey City, St. Peter’s University is a private, Jesuit college offering over 60 undergraduate and graduate programs to more than 2,500 undergraduate and 800 graduate students. Stevens Institute of Technology, located in Hoboken, is a private, research university ranked 7th by U.S. News & World Report as a Leading University Granting STEM Degrees. Hudson County Community College is a two-year public community college with campuses in Jersey City and Union City offering degrees or certifications in Art, Business, Computer Science & Technology, Criminal Justice, Culinary Arts, Education, Electrical Engineering, Engineering Science, Human Services, Nursing, Psychology and Sociology. When the work day is done, Hudson County offers something for everyone. From fabulous parks such as James J. Braddock Park in North Bergen and Liberty State Park in Jersey City to a burgeoning arts scene across the County- there is something for everyone. Looking to hit the links? Hudson County is home to Skyway Golf Course at Lincoln Park West in Jersey City offers Hudson County’s finest public golf experience offering a fun and challenging 9 hole course in the shadow of the Pulaski Skyway with panoramic vistas of the Manhattan skyline. For Foodies, Hudson County’s dining scene is sure to please. From neighborhood bistros and ethnic delights to waterfront dining with a view of the Manhattan skyline- Hudson County’s restaurants and bars make for the perfect night whether for business or pleasure! Check out the Hudson County Office of Cultural & Heritage Affairs/Tourism Development- Visit Hudson Website for all things Hudson County! Hudson County is a great place to live, work, play and grow your business. Come and see for yourself! Let the Hudson County Economic Development Corporation help you open the door to Hudson County! 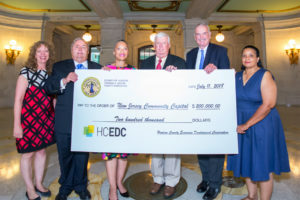 The Hudson County Economic Development Corporation (HCEDC) has joined New Jersey Community Capital to develop a new Hudson County down payment assistance program targeting veterans and low-income families. This program will provide a grant of up to $15,000 per household towards a down-payment to qualified veterans or other eligible applicants who are purchasing a primary residence in Hudson County. In addition to down payment assistance, home buyers will be connected with affordable mortgage financing through non-profit credit unions and other qualified lenders as well as free HUD-certified housing counseling helping to ensure sustained, successful homeownership. The Down Payment Assistance Program is being funded through a $200,000 allocation from the HCEDC. At least 50% of the grants are earmarked for qualified veterans. Other applications from limited-income homebuyers are welcome. For more information or to apply, please visit us online our website.